Cooking rice in large quantities is relatively easy once you get the hang of it. However, it's nearly impossible to do on a stovetop in a residential kitchen because your burners will be too small for the large pots you'll require. Some outdoor propane cooking stoves are big enough to do the trick, but ideally, you'll have access to a commercial or restaurant kitchen. Alternatively, you can bake the rice in batches in the oven. The answer to the question of "1 cup of rice is how many servings" depends on how many other items you plan to serve to make up your meal. 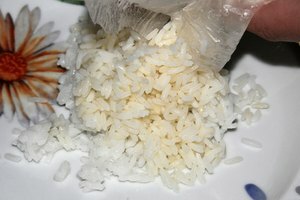 One cup of dry rice makes about a pound of cooked rice, which is four servings if your meal also includes a main dish and at least one other side. To cook rice for 200 people, use two 20-quart pots or one 40-quart pot. If possible, to avoid burning the rice, use heavy, high-quality pots that will distribute the heat evenly. Either boil 12 quarts of water in each of the 20-quart pots or boil 24 quarts of water in the 40-quart pot. Salt the water if desired. While the water is boiling, measure 24 cups of rice for each pot. After the water comes to a boil, slowly add the rice. Once the water returns to a boil, lower the heat and cover the pan tightly, and then cook it on low heat until all the water is absorbed. The cooking time varies depending on the type of rice you're using. Don't stir the rice while it's cooking. The trick to cooking rice in large quantities without burning it is to turn off the heat once the rice puffs up to the level of the water, which occurs a little before the rice is almost fully cooked. Then let the heat that's already in the pot continue cooking the rice until the water is fully absorbed. White rice cooks faster than brown rice, and long-grain rice cooks faster than short grain. 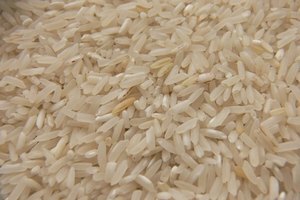 White rice or white basmati rice can cook in as little as 15 to 20 minutes, and short-grain brown rice usually takes 30 to 40 minutes. The higher the flame, the quicker your rice will cook. However, cooking your rice too hot can leave you with a burnt mess to clean, and your rice could be chewy, because water gets boiled out of the pan rather than steaming back into the rice. When cooking rice in large quantities, allow some extra cooking time. It'll take longer for the water to boil, and the rice itself will take longer because of the sheer volume. The oven method of cooking rice is relatively foolproof as long as you have enough oven space or enough time to cook the rice in batches. 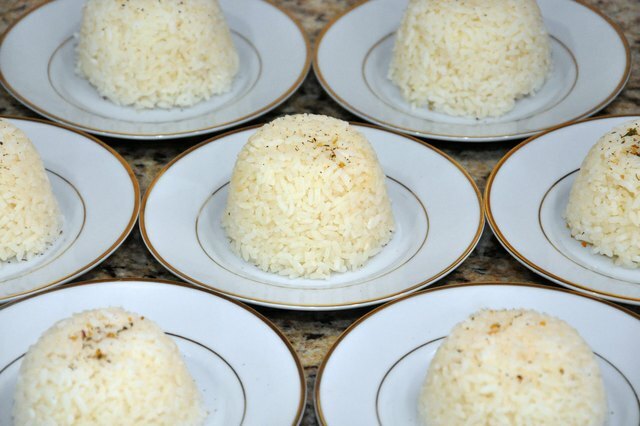 To make oven rice for 50 people, use 12 cups of dry long-grain white rice or white jasmine or basmati rice. Preheat the oven to 350 degrees Fahrenheit. Lightly spray a large roasting pan with oil, and then spread the rice on the bottom of the pan. Boil 5 quarts water on the stovetop. Add 1 tablespoon salt or, if you prefer, leave the water unsalted. Carefully pour the water into the roasting pan with the rice. Cover the pan with foil and then bake it until all the water is absorbed, about 40 to 45 minutes. To cook rice in the oven for 200 people, you'll probably have to do two batches of two pans each unless your oven can accommodate four shelves. Start your rice 1 1/2 to 2 hours before you plan to serve the meal, and boil the water for the second batch when the first batch is nearly done – it always takes longer than you think to boil a big pot of water. It's OK to leave the first batch at room temperature while the second batch is cooking, because it won't cool down enough in 45 minutes to create food safety concerns.